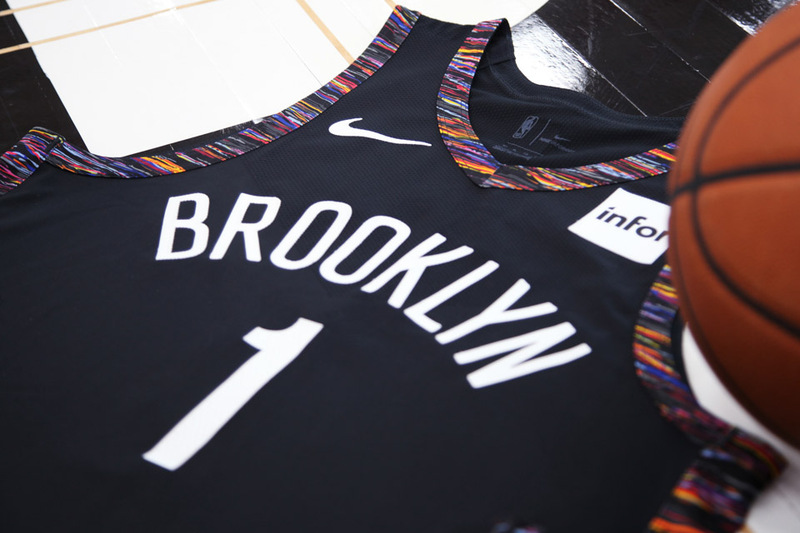 The Brooklyn Nets are paying homage to a Brooklyn hip-hop legend with their 2018-19 Nike City Edition uniform, which is being unveiled today. 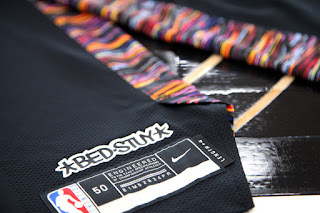 A multi-color "Brooklyn Camo" pattern inspired by Biggie runs down the sides of the jersey and shorts and along the sleeve and neckline piping. A customized *BED-STUY* mark for each player has been designed by renowned graffiti artist Eric Haze and been placed above the jersey's jock tag. Lots of positive quotes from Nets players, of course, in anticipation of the Nov. 17 game unveiling. But I kind of think the logos of Nike and Infor remind us this is about marketing. Commenting on NetsDaily, one fan checked the price on shorts and wrote "EIGHTY BUCKS... nevermind. no longer must have." Indeed, they're $80! A ballcap is $30. An article in the Athletic is headlined How the Nets are betting on ‘The Block’ to be the heart of a growing Brooklyn fanbase. The Nets unveiled “The Block: Home of the Brooklyn Brigade” in section 114 this season, which is sponsored by East Coast Power and Gas. Approximately 175 Nets fans attended tryouts to become members of the section. At the end of tryouts, 50 people were selected as members and received free season tickets. Of those 50 members, roughly half were part of the Brooklyn Brigade. Members of The Block can bring friends, but the friends pay a discounted rate. The maximum amount of seats in the section is roughly 75 people. Yes, there's a sponsor. These days, there always is. The Brooklyn Brigade is a collection of LOUD, PROUD, and PASSIONATE fans of the Brooklyn Nets who have come together to form an independent supporters club for our favorite NBA team. We amplify the Nets’ home crowd advantage and contribute to a positive and supportive environment for our players by cheering, chanting, and getting the crowd going all game long ... while having a great time along the way!